Merton Council saw Mitcham’s clock tower restored to its former Victorian splendour as the faithfully restored lamps were re-installed today. 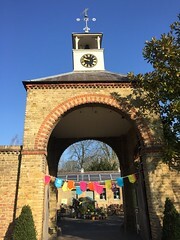 Refurbishment of Mitcham’s iconic clock tower is part of the council’s Rediscover Mitcham project and is supported by the Heritage Lottery Fund. The clock was built in 1898 to mark Queen Victoria’s Diamond Jubilee and it is thought the lanterns were removed in World War II. Restoration was completed by specialist clock makers Gillett & Johnson. The restored clock tower now includes a drinking fountain at the base, electric lanterns to illuminate the clock face, and a new weather vane. Over the next few days, the council will be fixing small plaques to the benches surrounding the clock tower which will display local history facts and tell the tale of the clock tower’s heritage.